Nisryn is 35 years old. She lives at LM Village in Greece with her six children (aged 15, 13, 9, 6, 4 and 2). They have been waiting for well over a year to be reunified with their father in Germany. Before the war in Syria began, Nisryn and her family lived in Kobane, a city just south of the Turkish border. She went to college, and then in 2001, started a family with her husband. He was a carpenter. They had two homes, a car, and a good life. Just six days after Nisryn gave birth, the family left Kobane. Nisryn and her family, among a group of other people, travelled by car to the Turkish border. A smuggler showed them where to cross the border by foot that night, and told them to head for the lights of a distant town. Sabri, Nisryn’s 11-year-old son, tripped and fell in to a barbed wire-lined trench that had been dug to prevent people crossing. Sabri, and others in the group who fell, were badly cut – although Sabri, typical of a young boy, was more concerned about the damage to his new trainers! Nisryn and her family walked, under cover of darkness, for two hours. On reaching the town, a car then took them to a local bus station for the 18-hour journey to Istanbul. The family lived in Istanbul for over two years, in a home arranged for them by relatives. Nisryn’s husband was able to find some carpentry work, but in order to earn enough for the family, Sabri and his younger brother Abdul (10) found jobs making clothes. Sabri soon learnt Turkish: from the age of 12, he worked as a translator for Syrians trying to make their way to Europe. 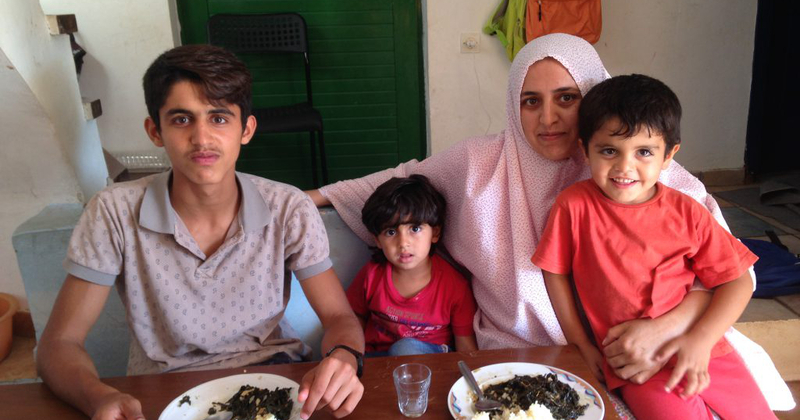 Nisryn’s husband left Turkey after 2 years, to try and find a better life for their family. He travelled first to Greece, then through Macedonia and Serbia, and then on to Germany. Nisryn’s husband found someone who could assist the family’s onward journey to Europe, for a cost of about $2,500. Nisryn travelled alone with her six children, the youngest just a year old. “We took a car to the beach, and there were so many people there. They loaded up two boats and we got in the second one with other people from Syria and Afghanistan. The Turkish coastguard tried to stop the boat. They told us to stop, and wanted to arrest the man driving the boat, but he was just a refugee like us. Nisryn and her children arrived in Greece in March 2016, shortly after the borders had been closed. The seven of them were moved from Lesvos to Athens, before being transferred to LM Village. Nisryn and the children are eligible for family reunification, which gives them the legal right to join her husband – their father – in Germany. However, the bureaucratic process is slow: Nisryn and her family have been stuck in Greece for almost eighteen months. Finally, in August of this year, Nisryn received the wonderful news that their application for asylum in Germany has been successful. We hope that the whole family will be reunited soon. Nisyrn says she will learn German because she can’t go home. She asks what it is like in Germany. We wish Nisryn, her husband and their children all the best for their next chapter in Germany – and send extra good luck to Sabri and his football dreams! Nisryn’s story was initially shared by Refugee Support, one of our partner organisations that work in LM Village. Refugee Support is one of the 35 grassroots groups that we support across Greece. We rely on your generosity to help them, and to help families like Nisryn’s. To donate, please click here. Thank you.